“Bottom line, my job is about achieving outcomes. It’s nice and all to cater to the patient but, at the end of the day, what matters more to their health and our success than our focus on educating patients to adhere to the treatment plan?" 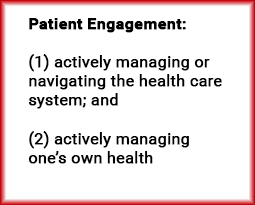 A good place to start is to consider what we mean by the term “patient engagement”. 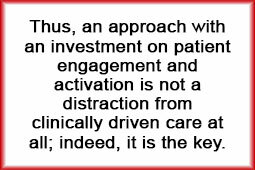 A more traditional perception is that we want to engage patients “to do what the clinician says”. This is contrary to a more modern and empowering view that by engaging patients we help them to: (1) actively manage or navigate the health care system; and (2) actively manage their own health.1 Truly embracing the latter assumption demands that we surrender control and support the patient’s autonomy, which can be discomforting. 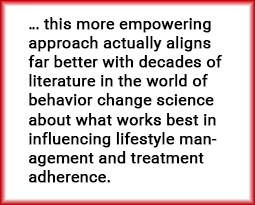 The good news is that this more empowering approach actually aligns far better with decades of literature in the world of behavior change science about what works best in influencing lifestyle management and treatment adherence. In the traditional medical model, there is a medical hierarchy: the provider is the expert who provides the treatment plan, and the patient is either compliant or non-compliant. This works well when an individual is: (a) in agreement with the proposed treatment; (b) motivated to act; and (c) has the resources, support and appropriate plan to follow through. However, if someone is in precontemplation or contemplation stage – for whatever reason – and they are scolded, judged, patronized, and directed without consultation, consideration, or validation of personal circumstances, needs, motivating factors, or abilities, they are more likely to resist, shut down, make counter-arguments, or become passive.2 The end result is that, ultimately, many of these patients end up not following through with the treatment plan. There is much research that supports the premise that a clinician’s directive approach causes the emergence of “discord”, which is correlated with negative clinical outcomes.3,4 Subsequently, patients are labelled as “non-adherent” or “non-compliant” and treated as such during the next clinic visit. Naturally, this interaction entrenches the patient’s resistance and creates a dysfunctional relationship between provider and patient. Instead of understanding that the clinician’s approach actually created the discord and resistance, the patient is blamed for lack of engagement and being uncaring about their health. Therefore, if a provider has the overarching goal of activation when discussing health status and treatment plan with a patient, the approach and resulting interactions are far different than the directive approach described above. Instead of defaulting to immediately telling someone what to do and how to do it, we first elicit their understanding of the situation, treatment plan, and benefits, before helping them to identify motivating factors and possible barriers. When a patient feels more supported, more understood, and less judged, they are likely to be more engaged and open to a discussion about change.2 The emergence of this “change talk” leads to a higher commitment strength to the lifestyle change or treatment plan, which is directly correlated with positive clinical outcomes.3,4,7,8 Thus, an approach with an investment on patient engagement and activation is not a distraction from clinically driven care at all; indeed, it is the key. The rapid implementation of an alternative pay model (from a fee-for service to a pay-for-performance system) is a critical step in achieving a healthcare system that provides better and more affordable care. Ostensibly, it will create demand for better patient engagement and satisfaction, effective self-management of chronic conditions, and successful adherence to treatment plans. If these models are to be successful, it behooves providers to adopt an approach that encourages patients to become highly activated and engaged in their own care in order to drive improved clinical outcomes and effective management of population health. 1 Gruman J, Rovner MH, French ME, et al. From patient education to patient engagement: Implications for the field of patient education. Pat Educ Coun 2010;78:350-356. 2 Moyers TB. The Relationship in Motivational Interviewing. Psychotherapy 2014;51(3):358-363. 3 Amrhein PC. How does motivational interviewing work? What client talk reveals. J Cogn Psychoth Special Issue: Motivational Interviewing: Theory, Research, and Practice 2004;18:323-336. 4 Apodaca TR, Longabaugh R. Mechanisms of change in motivational interviewing: A review of the evidence. Addiction 2009;104:705-715. 6 Mosen DM, Schmittdiel J, Hibbard J, Sobel D, et al. Is Patient Activation Associated with Outcomes of Care for Adults with Chronic Conditions? J Ambulatory Care Manage 2007;30(1):21-29. 7 Barnett E, Moyers TB, Sussman S, et al. From counselor skill to decreased marijuana use: Does change talk matter? J Subst Abuse Treat 2014;46:498-505. 8 Moyers TB, Martin T, Houck JM, Christopher PJ, Tonigan, SJ. From In-Session Behaviors to Drinking Outcomes: A Causal Chain for Motivational interviewing. J Coun Clin Psych 2009;77(6):1113-1124.